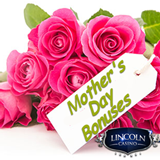 This weekend Lincoln Casino pays tribute to moms with a generous Mother's Day Casino Bonus. You may not know Lincoln, but you may know the WGS games they have, like the classic Agent Cash and the brand new Mine All Mine. This weekend you can claim a 110% bonus up to $440 if you use coupon code LCMOM15 when you deposit. This coupon code is valid until this Sunday, May 10th, only. Claim up to $440 Mothers Day Casino Bonus until May 10th. Until the end of May, you'll also get double comp points on all wagers on Keno and progressive jackpot slot games, including the new Mine All Mine. Mine All Mine is a prospector-themed game with a progressive jackpot feature that can be triggered at random after any spin. Lincoln Casino welcomes players from around the world, offering over a hundred unique casino games from WGS Technology. It's most popular games are also available in its new mobile casino including the new Cool Bananas mobile slot game.